What can I reuse or recycle to build a cold frame? | How can I recycle this? What can I reuse or recycle to build a cold frame? I’m having lots of fun growing stuff in our new garden. The old garden was considerably small and got no (no!) direct sunlight whatsoever, which made growing things a little difficult. Here we get a lot more sun – in different spots throughout the day – and that’s actually been a bit of a problem this summer – my current nursery area (the porch) has been getting a bit too hot for some types of seedlings. Next year, I’d like more nursery space generally too so I thought a cold frame would make sense. 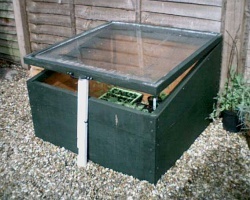 Cold frames are one of those great DIY projects with more people probably building their own out of scrap than buying them new. But I’ve got a bit of builders’ block – unable to think what to use. I’ve got my eye out for old windows or the like, and I nearly yoinked my best friend’s old shower cubicle but it was way too big and would have been problematic to cut down – but aside from that, I can’t think what else I might use for the clear parts. Any suggestions? As for the frame, my dad built his latest coldframe using the frame of my old childhood bed (a divan, so a ready-made frame), which made me start thinking about other ready-made frames to make it easier for my weak woodworking skillz: we’ve got an old table that could be flipped upside down to provide a solid base and uprights – attaching stuff to them would probably be a lot easier than starting from scratch. Any other suggestions? Any pros/cons to brick or wood frames? What have you done? I was thinking that plastic sheeting could be used for the window portion if you don’t have glass. You could create a frame from scrap 1×2’s then nail the plastic to it. Old shelving could be repurposed by laying down on it’s back then enclosing the sides with bricks or scrap lumber. Wood frames need protecting from the elements. Avoid anything that will soak up the water and rot – MDF is no good outside. Paint the inside white and it’ll reflect more light onto the plants! That’s a good idea. I’ve heard it suggested to paint the insides of closets white for the same reason. Since they are ususally pretty dim inside…. And you could paint or marine varnish the wood, if wood is what you have to built with. Most paint places have a “oops” shelf, of paint that was mixed, and not sold-color not quite right, ect, or dented, unlabled cans. Great if you don’t care about color. If you can get a solid wood wardrobe or big cupboard from a skip or on freecycle then you could use it on its side with the door on top. Cut out the middle of the door to just leave the hinges and frame, then staple clear plastic over the middle of the door. You’ll need UV resistant plastic so it doesn’t degrade in sunlight, e.g. an offcut of the stuff they cover polytunnels in, or use clear perspex or corrugated clear plastic designed for use on roofs. Paint all wood on the wardrobe or cupboard with decking or fence protector first to stop it rotting – this stuff is basically wax suspended in water so will stop the wood getting damp and is non-toxic. We had to have a leaking skylight replaced in the attic, and I’ve made a box from old pallets cut and assembled to fit the old window exactly. I was able to reuse the old hinges, too, so the only expenses I had were the screws, really. I treated the box with two coats of cheap olive oil (it had gone off a bit, too, and of no use in the kitchen) – this way the wood will keep for an additional two-three years. But, yeh, it might be easier if you don’t have the window to take your route using any old box-shaped piece of furniture and a sheet of UV resistant plastic. I would not use anything made from chip board and similar, though, seeing as how the glues they use are pretty toxic. For the glass even a cut-off piece of polycarbonate can be used. Or several – they’re not hard to join. You can sometimes find scraps of them near building sites – chance is that they’ll give them to you for free if you ask nicely – or even at recycling stations. After my dad renovated our house, he made cold frames using wooden boards and old windows that he saved from the renovation. He put the windows on hinges so that these could be propped up if too much moisture accumulated inside the frames. I got free windows from a glazer in our town. He said I could have as many as I liked from his skip. My husband and father in law then built me a cold frame using one of the bigger windows and some wood left over from when they built their garage. I use the rest of the windows lying down on the veg patch in spring to warm up the soil before planting. chetnovak@hotmail.com is an impatient, cheap, New Englander. COST: $ 1.00 for some plastic and tape. Always wanting to start earlier than the suggested starting dates for warmer weather lovers (like tomatoes, eggplant, pepper, etc.) here is my solution. Pictures available if you contact me. I use banana shipping boxes that are going to be discarded. The ones I get at ALDI Foods have a double cardboard side. The bottom has an opening about 6″ X 10″ and the tops are open. There are ventilation holes already in the sides of the box. I merely tape clear plastic over the top and punch a few holes in it for ventilation but also so I don’t need to move it to water my plants. I put one hole about the size of my thumb right above the plant. I put the plant into its permanent home and put the mini-greenhouse on top of it. There is an added bonus. The boxes come with a very thick paper bottom that covers the hole in the bottom of the box. It also has ventilation holes already in it. I cut a hole about 3″ x 3″ in it, and place it so the hole is where I want my plant to be. I place the paper on the soil and dampen it. Using whatever is handy (this year it was a future garden stake) I drive it a few inches into the soil thru that hole and wiggle it all around. Once the hole is big enough I remove my plant from its container and place it in the hole…some firm pushes around the outside of the hole and the planting is done. For several days I wet the paper down well to make it mold to the ground. In prior years I used newspaper because it is much easier to get to mold to the ground and also because it can be mulched into the soil at season’s end. This heavy paper is an experiment for this year…I suspect I will go back to the newspaper next season.